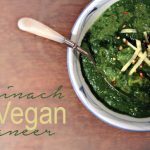 Today I want to share with you one of my favorite Indian healthy meals – Palak paneer (spinach gravy with Indian cottage cheese). Traditional Palak paneer is made soft cheese that is not aged, called paneer. To make this recipe fully vegan friendly we will be using tofu instead of paneer. I encourage you to give this dish a try, as it’s easy to make, smells amazing and has just the right amount of richness and spice. I encourage you to give this dish a try, as it's easy to make, smells amazing and has just the right amount of richness and spice. 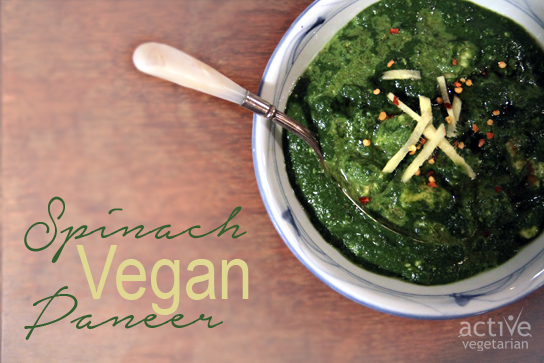 Boil the spinach for two minutes in a cup of water.Once its cool, puree in high speed blender until all smooth. Cube the tofu and keep aside. Heat oil in a deep skillet and add the cumin seeds. Once it splutters add onions and saute until slightly golden. Add ginger and garlic and saute until raw smell disappears. Add the tomato puree and spices,salt and cook on medium heat for about 5-6 minutes. Add the pureed spinach and tofu and let it simmer on medium heat until tofu is soft.Add a little water if its too thick. Add the coconut creme.Turn off the heat. Serve hot with quinoa or brown basmati rice.